illustrated by Alan and Lea Daniel. 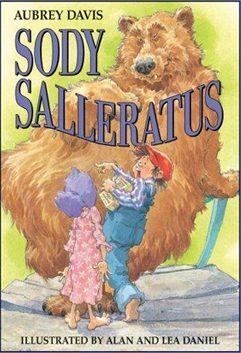 A simple trip to the store for a box of sody salleratus (baking soda) turns into a disappearing act for a boy, girl, old man and old woman. A little squirrel skippity skips down the road to find them. The simple plot, filled with lots of repetition and fun-to-repeat sounds, is perfect for reading aloud. Exuberant illustrations leap off the page, adding hilarious details that enhance this lively retelling of the traditional tale. “Aubrey Davis’ story is finely written and humourous, but the combined illustration efforts of Alan and Lea Daniel boost this amusing tale into the realm of an instant classic.” Canadian Book Review Annual, 1997.